The Phoenician era saw a shift in Canaanite religion. The larger pantheon became pushed to the side in favor of previously less important, singular deities who became or were already, the patron Gods of Cities. Different cities had different concepts of which Gods were most important and what some of the gods basic attributes were. 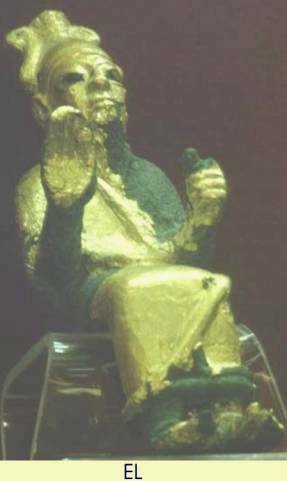 While El or Il, whose name means 'god', is commonly described as the creator of the earth, the Aramaeans ranked Hadad before him. Also, many city gods were named Baal, meaning 'lord'. 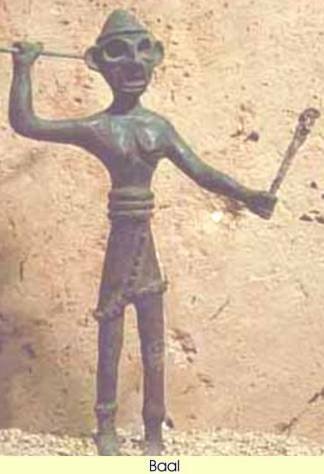 Baal-Sidon, the city god of Sidon was thus an entirely different deity than Baal-Hadad, the storm god. He is known as the Father of the gods, 'the father of mankind', the 'Bull', and 'the creator of creatures'. He is gray haired and bearded and lives at Mt. Lel. He is a heavy drinker and has gotten extremely drunk at his banquets. He orders that Yam be given kingship and sets Kothar-and-Khasis to build the new king a throne. The gods warn that Yam has been shamed and may wreck destruction, so El ameliorates him by renaming him mddil - 'beloved of El' and throws a feast for him. El warns though that this is contingent on his driving out Baal, who may fight back. Following Yam's demise, he favors the god Mot. While Baal is declared king and judge, he remains a resident of El and Athirat's palace as El refuses him permission to build an appropriate mansion, in spite of Shapash. When Baal-Hadad's monsters assail the handmaidens of Yarikh and Lady Athirat of the Sea, he advises them to give birth to beasts which will lure Baal-Hadad away on a hunt. El's loving consort and is protective of her seventy children who may also be known as the gracious gods, to whom she is both mother and nursemaid. Her sons, unlike Baal initially, all have godly courts. She frequents the ocean shore. In the Syrian city of Qatra, she was considered Baal-Hadad's consort. While washing clothing with a female companion by the sea, she is spied by El, who roasts a bird and invites the two to choose between being his daughters or his wives. They choose to become his wives and in due course give birth to the gracious gods, the cleavers of the sea, including Shachar and Shalim. The new family builds a sanctuary in the desert and lives there for eight years. Baal and Anat hope to use her to influence El on the issue of Baal's palace. Initially suspicious and fearful of them on behalf of her children, but she warms up when she see that they have brought gifts. She and Anat successfully intercede with El on Baal's behalf for permission for Baal to build a more suitable court. When Baal is found dead, she advocates her son Athtar be made king. Her sons, the "'pounders' of the sea", apparently colluded with Mot and were smited by Baal with sword and mace upon his return. Baal-Hadad's creatures devour her handmaidens, so she sends them to El. El tells them to go into the wilderness and there birth horned buffalo, which will distract Baal-Hadad. She and Anat serve as nursemaids for Keret's son Yassib, but reminds Keret of his pledge of wealth for Huray, perhaps causing his decline in health because of its lack of fulfillment. He is the craftsman god and is identified with Memphis. He is ordered by El to build Yam's throne. He upbraids Yam for rising against Baal and threatens him with a magic weapon. He gives Baal the magic weapons Yagrush (Chaser) and Aymur (Driver). He crafts Baal's bribe for Athirat, a temple serving set of gold and silver. He build's Baal's second house and insists over Baal's objections on including a window. He constructs a bow and arrows set for Aqhat, presenting them first to Daniel and staying for a feast. Twins and one of the first, if not only, pair of gracious gods, the children and cleavers of the sea. They were born of El and Athirat or her female companion. The new family builds a sanctuary in the desert and lives there for eight years. According to Isaiah 14:12, he is the father of Helel or Lucifer, the 'light-bringer', usually taken to mean the morning-star. The son of El, the god of fertility, 'rider of the clouds', and god of lightning and thunder. He is 'the Prince, the lord of earth', 'the mightiest of warriors', 'lord of the sky and the earth' (Alalakh). He has a palace on Mt. Zephon. He has a feud with Yam. His voice is thunder; his ship is a snow bearing cloud. He is known as Rapiu during his summer stay in the underworld. He upbraids the gods for their cowardice when they intend to hand him over to Yam's messengers and attacks them but is restrained by Athtart and Anat. Kothar-and-Khasis gives him the magic weapons Yagrush (Chaser) and Aymur (Driver). He strikes Yam in chest and in the forehead, knocking him out. Athtart rebukes Baal and calls on him to 'scatter' his captive, which he does. In a alternate version of this episode, he slays Lotan (Leviathan), the seven-headed dragon. The battle may have been representative of rough winter sea-storms which calmed in the spring and which were preceded and accompanied by autumn rains which ended summer droughts and enabled crops to grow. After his victory he holds a feast and remarks on his lack of a proper palace, instead retaining residence with El and Athirat. He sends messengers to Anat to ask her to perform a peace-offering that he might tell her the word which is the power of lightning and seek lightning on the holy Mt Zephon. him to allow its inclusion so that he might lightning, thunder, and rain through it. At its completion he holds a feast, takes over scores of towns and allows the window to be built. He threatens to ask Mot to invite any of Baal's remaining enemies to come for a visit and at night, binds the lightning, snow and rains. He sends Gupn and Ugar to Mot to invite him to acknowledge his sovereignty at his new palace. He sends messengers to Mot to carry this message to him and they return with a message of such weight that Baal declares himself Mot's slave. He hopes to ameliorate Mot by having Sheger and Ithm supply live sheep and cattle for the god to feast upon. Fearing Mot he seeks Shapshu's advice and sires a substitute on a cow. He (or possibly his substitute) dies and remains in the underworld for seven years. El dreams that he is alive again but he is absent. Ashtar attempts to take Baal's place, but can not. Shapshu searches for him. Baal returns and fights Mot's allies, the sons of Athirat and the yellow ones. After seven years, Mot returns, demanding one of Baal's brothers lest he consume mankind. Baal rebuffs him and they fight tooth and nail. Shapshu separates the two declaring that Baal has El's favor and Baal resumes his throne. Once when he was out hunting, Anat followed him. He spotted her, fell in love and copulated with her in the form of a cow. She gave birth to 'a wild ox' or a 'buffalo', telling him of the event on Mt. Zephon. This is probably not their only affair. 'she of dew', 'daughter of drizzle' Baal's daughter. 'she of the earth', 'daughter of [ample flows]' Baal's daughter. She restrains Baal when he intends to attack Yam's messengers. She rebukes Baal for holding Yam captive and calls on him to 'scatter' Yam, which he does. Apparently she, along with Anat, is willing to become Baal's cupbearer once he achieves a proper palace. She is the sun-goddess (Akkadian Shamash - a male deity) and is known as the torch of the gods and pale Shapshu. She often acts as messenger or representative on El's behalf. She has some dominion over the shades and ghosts of the nether-world. Kothar-and-Khasis may be her companion and protector. After sunset he embraces Nikkal-and-Ib and becomes determined to marry her. He seeks Khirkhib out to arbitrate the brideprice, but instead Khirkhib suggests other potential mates in the daughters of Baal. Undaunted, Yarikh presents a lavish brideprice to Nikkal-and-Ib's family and the two are wed.
'drives away' She is the flying demoness who drives away Keret's disease on behalf of El with a touch of her wand to his head. (Melqart, Baal Tsur, Milkashtart?) - 'king of the city', the hunter, 'fire of heaven'. Chaos gods, Death Gods, and Baneful gods. 'the beloved one'- Mot is the god of sterility, death, and the underworld. In one hand he holds the scepter of bereavement, and in the other the scepter of widowhood. His jaws and throat are described in cosmic proportions and serve as a euphemism for death. When he has influence over Shapshu, it is unusually hot and dry. He sits on a pit for a throne in the city of Miry in the underworld. Prior to the conception of the gracious gods, he is pruned and felled like a vine by the vine dressers. He is favored by El following Baal's defeat of Yam and Baal refuses him tribute. When Baal's messengers deliver him an invitation to feast at Baal's new palace, he is insulted that he is offered bread and wine and not the flesh he hungers for. In fact, he threatens to defeat Baal as Baal did Leviathan, causing the sky to wilt and then eat Baal himself. Baal would then visit his palace in the underworld. He is pleased that Baal submits to him. Baal goes to the underworld and either he or his substitute is eaten by Mot. Presumably the sons of Athirat had some part in his death. After seven years of famine, Anat seizes Mot, splits, winnows, sows and grinds him like corn. Baal eventually returns and defeats Mot's allies. After seven years Mot returns and demands Baal's brother, lest he wipe out humanity. Baal rebuffs him and the two have a mighty battle, but are separated by Shapshu who declares Baal to have El's favor. He is probably a chthonic deity. 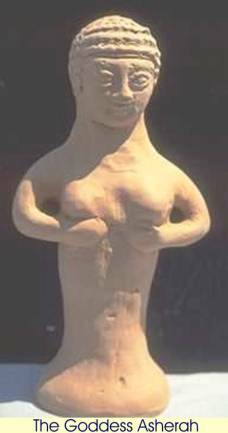 Not explicitly found in the Ugarit texts, Molech is a bit of an enigma. He shows up in the Old Testament in Leviticus 18 and 20, 1 Kings 11, 2 Kings 23, and Jeremiah 32. From that he appears to be a god of the Ammonites - a region west of the Jordon – it is said that worshipers there, sacrificed children in fires at temples, some of which were in the Valley of Hinnom, i.e. Gehenna, just south of Jerusalem. The Old Testament also names the similarly spelt "Milcom" as a god of the Ammonites leading to the suspicion that they are the same god. Molech is probably not the original name of the deity. There has been a good deal of argument as to whether Molech could be identified with another foreign deity and which deity that would be, or whether molech was simply a term which referred to child sacrifice of any sort. The Canaanite gods Mot and Milqart of Tyre, and the Mesopotamian god Nergal, whom it is believed is somewhere referred to as Malik=king, are a couple of the prime candidates for being Molech. Returning to his estate with Huray, Keret is blessed by El at Baal's behest and is promised eight sons, the first of which, Yassib, shall have Athirat and Anat as nursemaids. In addition, Huray will bear eight daughters all of whom as blessed as a first-born child. Athirat calls attention to Keret's promise of wealth to Huray which he has yet to fulfill. Later, Keret and Huray prepare a great feast for the lords of Khubur. Later still Keret has become deathly ill and Huray entreats guests at a feast to morn for him and make sacrifices on his behalf. 'He of Harnan', a devotee of Rapiu (Baal) and a patriarchal king. Like Keret, Daniel is in mourning because unlike his brothers he had no sons. So, for several days he sacrificed food and drink to the gods. On the seventh day, Baal takes notice and successfully petitions El to allow Daniel and his wife, Danatay, to have a child, citing, among other reasons, that the child will be able to continue the contributions and sacrifices to their temples. El informs Daniel of his impending change of fortune. He rejoices and slaughters an ox for the Kotharat, pouring sacrifices to them for six days and watching them depart on the seventh. During some missing columns, Danatay gives birth to Aqhat. Later, Kothar-and-Khasis arrives with a specially crafted bow and arrows set for Aqhat. Daniel and Danatay hold a feast, inviting the god, and Daniel presents Aqhat with the bow reminding him to sacrifice the choices game to the gods. When Aqhat is slain, Daniel's daughter Pughat notices the eagles and the drought and becomes upset. Daniel prays that Baal might return the rains and travels among the fields coaxing the few living plants to grow and wishing that Aqhat were there to help harvest them. Pughat informs him of Aqhat's demise. Daniel then swears vengeance upon his son's slayer. In succession he spies some eagles, Hirgab, and Sumul. He calls upon Baal to break their wings and breast-bones, then he searches their insides for Aqhat's remains. Initially not finding them, he asks Baal to restore the eagles and Hirgab. Finding Aqhat's remains within Sumul, he buries him and calls upon Baal to break the bones of any eagle that my disturb them and curses the lands near which his son was slain. His court goes into mourning for seven years, at which time Daniel dismisses the mourners and burns incense in sacrifice to the gods. Pughat prays to the gods to bless her in her venture and disguises herself as Anat, intending to wreck vengeance upon those who slew Aqhat.